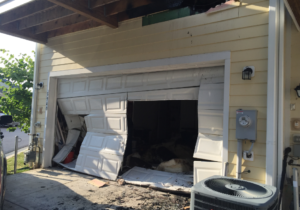 Damaged garage door from fire department. To be quite honest, there are a lot of emergency jobs companies do not want. It may be in an area of town they prefer not to work. The loss may be so minor, the profit margin in nearly insignificant. The homeowner may not have insurance and can not cover the costs, meaning the profit margin literally does not exist. The emergency may happen in the middle of the night or during a holiday or an incredibly important family event like the birth of your child (real story). The dirty truth is, restoration companies will and do cherry pick the emergency service calls they take. They will only go out if they’re vested interest is fulfilled. Modern doesn’t conduct business that way. Our emergency services division, 1-800-BoardUp guarantees a one-hour response time to anyone who calls needing our assistance. We don’t rescind this guarantee just because the job isn’t all we would’ve preferred or the timing is inconvenient. When we opened our emergency services division, we knew there was a greater social responsibility at stake; just basic neighborly compassion and helping your community. When someone calls 1-800-BoardUp, they are often at their most vulnerable, experiencing a really difficult time. It may be a house fire or it may be a broken window but to a homeowner, these incidents are incredibly stressful. Inside view of the damage. This past Sunday night, a little after 12pm, we got a call for a small house fire. If you weren’t aware, it is legally the owner’s responsibility to secure their property after a fire. Well, although the fire was relatively small, the fire department had to go through the garage doors to extinguish it, leaving the home vulnerable. 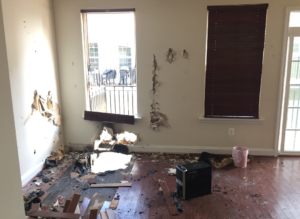 The homeowner’s called everyone they could think of from their insurance company to restoration companies they found online only to hear the same thing; it will have to wait a few days. It became quite clear to the homeowners that they were being pushed off as soon as they said they only needed their garage doors secured. Too tiny of a job for most to bother assisting them, that is until they called Modern. We were happy to come out and board-up their garage doors, even though it was small job and it was very late on a Sunday. We were at their home with our crews within the hour, just like we promised. We worked until 3:30am, securing their home and answering any questions. We even came back out the following morning to check on the homeowners. We truly believe that running your business with compassion and respect for your community is always the best policy. We don’t cherry pick jobs and we do not turn away homeowners who need assistance. It isn’t and should not always be about money. Sometimes, doing the right thing just has to become the priority above everything else. When we say one-hour guaranteed, you can count on Modern. 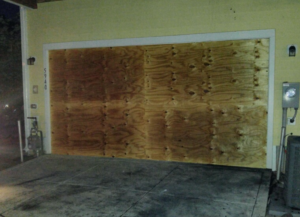 Properly boarded up and secured.